At the November 8 GAPP committee meeting, we reviewed the language in Section 1 of the grievance procedure with administrators. 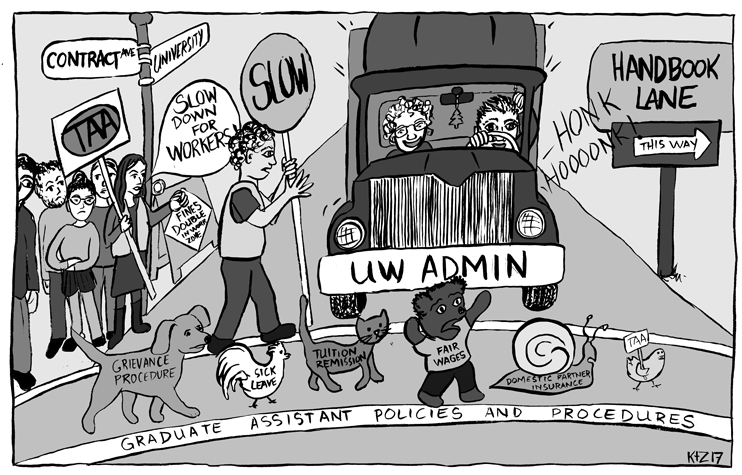 The next GAPP meeting will be held Thursday, December 6th at 1 pm in Bascom Hall 334. If you have had experiences such as overwork, misclassification, intimidation, or other workplace problems and concerns, we encourage you to come share your opinions and experiences at these meetings. We are the people living these policies, so we need to connect to our administrators what the policy language means for our lives. For more information, contact adria@taa-madison.org. Read the most recent GAPP updates here.